The Zero-Gravity Montage Pro massage chair is the ultimate massage chair that delivers comprehensive full body massage. Unlike a masseuse, the Montage Pro provides simultaneous massage treatments for your whole body. Use the automatic programs and melt away the stresses of the day. Or target specific areas with the manual options. The LCD touch screen makes selecting exactly what you want easy. 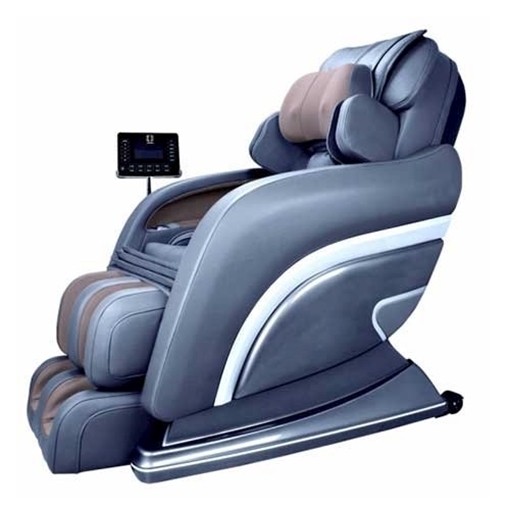 There are also fingertip controls in the armrests to adjust the massage or position of the chair while you are receiving a relaxing massage treatment. Recline the chair back to the Zero-Gravity position to improve blood circulation and better distribute the weight over your entire back. The Montage Pro was designed to give you the most complete and comprehensive massage of any massage chair available. Relax with the built in music system to ease your mind and let your muscles relax. Warm up your muscles with the full body heaters integrated into the chair back, seat and leg rest to make the massage even more effective. There are 5 automatic massage treatments using Chinese, Thai and Japanese massage techniques. There are 30 specially designed airbags to provide relieving compression massage throughout the body. The reflexology foot massage uses a combination of air bags, magnetic therapy, reflexology nodes and a foot roller for the ultimate in relief for the feet. The Montage Pro has you covered from head to toe for all your massage therapy needs. The Montage Pro is the Ultimate Massaging Machine™.